If you can't have fun in a Fiat 500, Abarth or otherwise, you aren't really trying. That doesn't mean it's a perfect car, though. 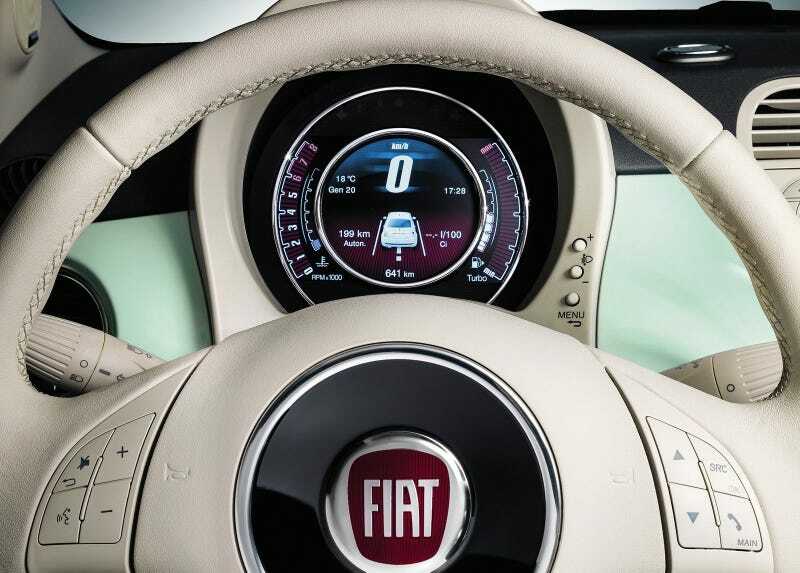 Now the new top model of the Fiat 500 includes a clever digital instrument cluster that's trying to be more user-friendly than the clunky old one. A refreshed 2014 Fiat 500 debuts at the Geneva Motor Show this week, and that includes a new top model trim named the 500 Cult. I guess that's meant in the way the car has a "cult following," but here in the U.S. it sounds a bit Jim Jones-y, if you catch my drift. Besides the Cult trim, the neat thing about the refreshed 500 is that it has a seven-inch TFT digital gauge screen that looks a lot more straightforward and easy to read than the previous car's integrated speedo and tachometer. In addition to speed, RPMs, fuel and boost, the new screen displays trip readouts, fuel consumption, which doors are open and closed, media information, which gear you're in, and other useful information. The whole thing seems a lot cleaner, a lot simpler, and that doesn't always happen when these things go digital. Beyond that, it's still the 500 we know and love. There's also a revised 900cc turbocharged two-cylinder TwinAir engine with with 105 horsepower and 107 pound-feet of torque, which sounds like it'd be pretty fun to drive. No word on whether we'll get that in the U.S. or not. I kind of wish we did.